Chronic neck and low back pain is a common debilitating condition affecting millions in the USA. This is usually the result of trauma, or age-related degeneration. Many patients suffer from chronic neck or low back pain that do not respond to conservative treatments with medications and physical therapy, causing severe limitations to the patient’s daily lives. Treatment of chronic neck and low back pain usually try to reduce the symptoms without fixing the problems that are causing the pain. These problems may affect multiple structures at the same time. Therefore, the pain may be coming from the discs, the facet joints of the spine, and from the tendons and ligaments that surround and support the spine. Chronic neck and low back pain that do not respond to conservative treatment is commonly treated with surgery. Spine surgery involves significant risks of potential complications and failure. Even successful surgery involves a long recovery period . RegenaSpine was developed to provide long-term relief of chronic neck and low back pain without surgery by using the body’s own healing power. 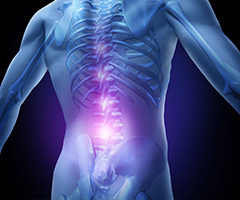 RegenaSpine uses a combination of stem cells, platelets, and growth factors to treat all of the components of chronic neck and low back pain: the discs, the joints, and the surrounding tendons and ligaments. RegenaSpine provides relief of chronic spine pain without surgery and using the patient’s own cells to promote regeneration and healing. RegenaSpine is a innovative, high-tech, safe, effective, non-traumatic procedure with minimal recovery time that is performed in an outpatient setting. RegenaSpine is exclusively performed at the Regenerative Orthopedic Institute. Schedule your free consultation today to determine if you might be a candidate for this state-of-the-art procedure.